Background: Neural tube defects are common congenital malformations of the central nervous system. Despite years of intensive epidemiological, clinical, and experimental research, the exact etiology of NTD remains rather complex and poorly understood. The present study attempted to look into the association of occurrence of NTD with reference to folic acid levels, along with karyotyping status. Materials and Methods: Detailed history was taken with emphasis on age of the baby and mother, parity, antenatal folic acid intake. Five milliliters of blood was drawn from all the babies and their mothers and divided equally in preheparinized vials (for karyotyping) and plain vials (for folic acid estimation). The total duration was 2 years. Results: The total number (n) in the study group was 75. The folic acid level was less in affected babies and their mother when compared to matched controls. 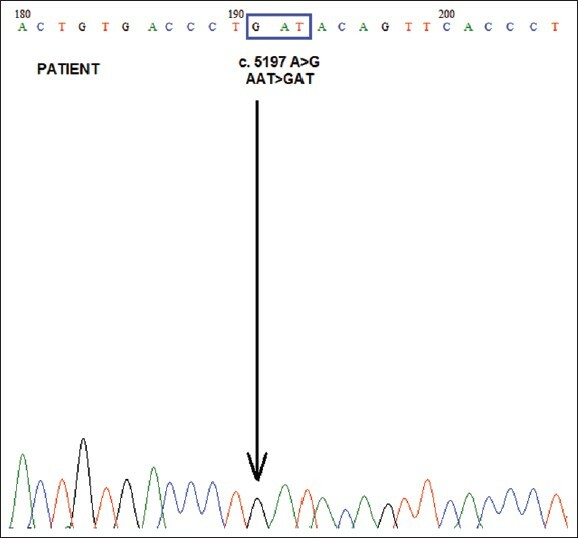 Chromosomal defect was observed in nine of the 75 patients. Karyotyping defects were higher in children born to mothers of the age group 31-40 years and when their birth order was second. Conclusion: Folic acid supplementation needs to be continued to prevent the occurrence of NTD, and the perinatal identification of NTD should alert one to the possibility of chromosomal abnormalities and prompt a thorough cytogenetic investigation and genetic counseling. 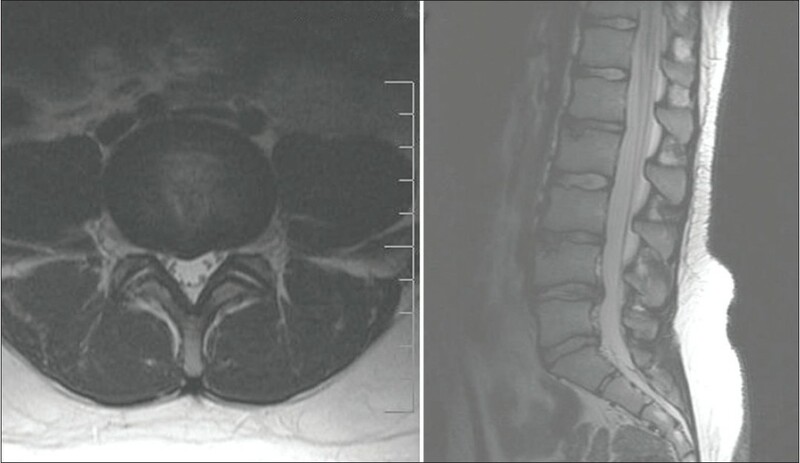 Introduction: Congenital spinal lipomas constitute an important group of lesions causing tethered cord syndrome. Management of these lesions is challenging and role of prophylactic surgery for these lesions is still controversial. Hence, current study was undertaken with the aim to evaluate the role of prophylactic surgery in the management of these lesions. Materials and Methods: A total of 147 consecutive patients, treated over a period of 10 years (January 2001-December 2010), are retrospectively analyzed. Results: In our study, 93 patients had conus lipomas, 26 had filum lipomas and 28 had only lipomeningomyelocele. Boys and girls were almost equally represented. The age of patients at the time of surgery ranged from 15 days to 34 years with an average of 62 months (5.2 years). Neurological deficits were present in 101 (68) patients. The patients with neurological deficits were older in comparison to those neurologically intact (average age 6.2 versus 2.8 years, respectively). Difference in age between the two groups was statistically significant (P value 0.03). Neurological deterioration was observed in 8 (5) patients following surgery, out of which six patients developed transient deterioration and only two, had persisting deficits. None of the neurologically asymptomatic patients developed persistent neurological deficits. In the symptomatic group, nine patients (9) showed improvement in neurological status after surgery. Conclusions: In author's view, prophylactic surgery for congenital spinal lipomas is safe and effective. However, a well designed randomized controlled trial, to definitely and objectively prove the usefulness of prophylactic surgery is needed. 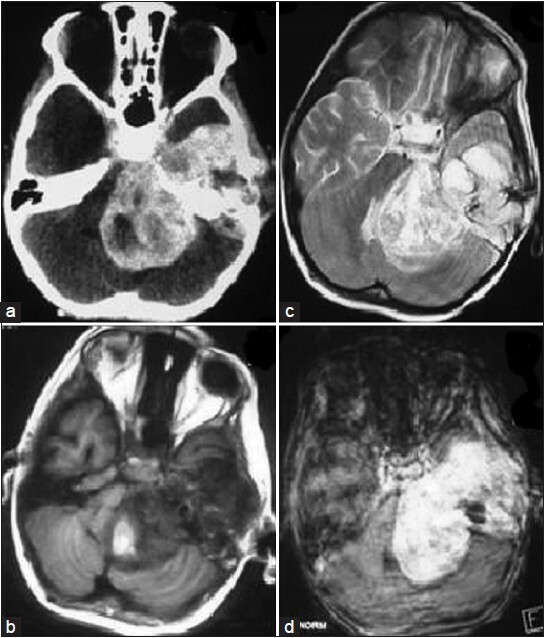 Object: Colloid cysts are congenital benign lesions, associated with more aggressive clinical and radiological picture in children than in adults. 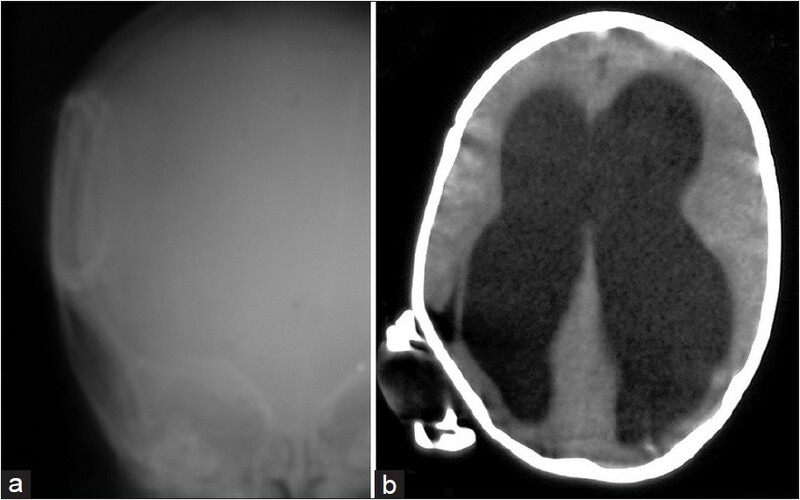 We present our experience in management of five pediatric patients with colloid cyst of the anterior third ventricle. They have an excellent chance of surgical cure, or they can be devastating and even fatal, if not recognized on time and treated. Materials and Methods: Five pediatric patients (aged 16 years or less) who were surgically treated for a colloid cyst, between 1987 and 2011 were analyzed. 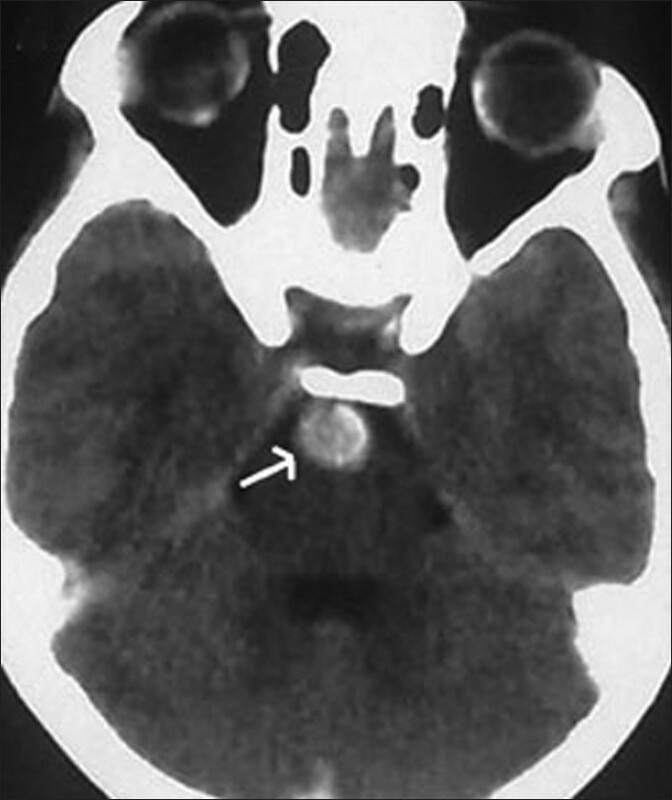 The clinical features included raised intracranial pressure in all five cases, of which one patient was brought unconscious with decerebrate posturing. Computed Tomography (CT) scan of the brain was done in all patients. The density of the lesion, enhancement with contrast and the presence of hydrocephalus were analyzed. Four patients underwent a detailed postoperative neurological assessment. Results: Three patients underwent the transcallosal-transforaminal approach and total excision of the lesion. One patient underwent revision of the pre-existing ventriculoperitoneal shunt. One patient who was brought in an unconscious state, an external ventricular drain was inserted and she was ventilated. She died 4 hours after the admission. On follow-up, none of the three patients who underwent the transcallosal-transforaminal approach had disconnection syndromes or behavioral disturbances. Conclusion: Colloid cysts in children are rarer and more aggressive than their adult counterparts. It is surgically curable. Early detection and total excision of the lesion is a permanent cure with minimum morbidity, when compared with the natural history of the disease. The limited anterior callosotomy does not result in disconnection syndromes or behavioral disturbance. Background: Timed up and go (TUG) is a quick test used in clinical practice as an outcome measure to assess functional ambulatory mobility or dynamic balance in adults. However, little information is available on TUG test used in cerebral palsy. Hence, the purpose of our study was to assess the intra-rater reliability of TUG test in cerebral palsy children. Aim and Objective: To assess within-session and test-retest reliability after 1 week of TUG test in cerebral palsy children. 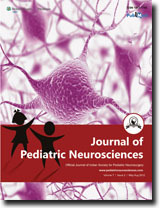 Setting and Design: It was an a cross-sectional observational study conducted in a neurorehabilitation unit, with 30 cerebral palsy children of 4-12 years, within Gross Motor Function Classification System (GMFCS) level I, II, III, and with an IQ ≥50.The sampling technique used was purposive sampling excluding children with cognitive deficit. Materials and Methods: Subjects performed TUG on three occasions - Initial assessment (time 1), 30 min after initial assessment (time 2), and 1 week after initial assessment (time 3). Three trails were conducted for each of the three occasions. The mean score of three trials was documented as the final score. Within-session and test-retest reliability were analyzed using scores of time 1 and 2, and time 1 and 3, respectively. Statistical Analysis: The documented data were analyzed for within-session and test-retest reliability after 1 week of TUG test by using intraclass correlation coefficient (ICC). Results: Reliability of TUG test was high, with ICC of 0.99 for within-session reliability and 0.99 for test-retest reliability. Conclusion: Intra-rater reliability of TUG test in cerebral palsy children was found to be high. Supratentorial anaplastic ependymoma is an uncommon tumor which can rarely present as a cyst with mural nodule on imaging. 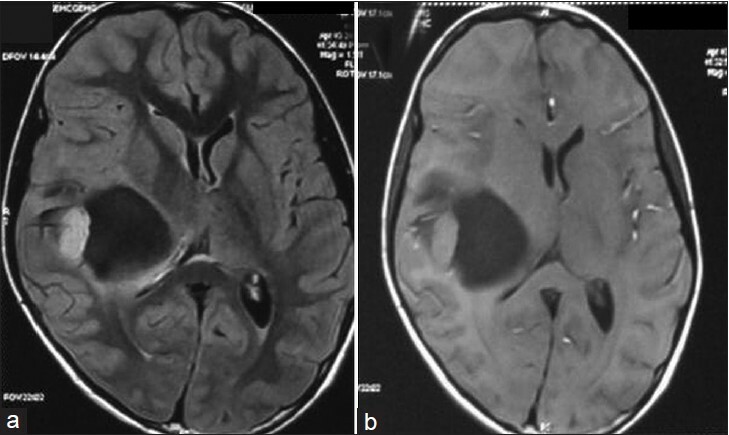 Authors present this unusual radiological appearance of supratentorial extraventricular anaplastic ependymoma in a 9-year-old boy. 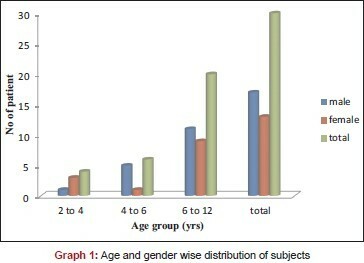 Arachnoid cysts are prevalent among the general population. The management options of symptomatic arachnoid cysts each have their own merits and disadvantages. 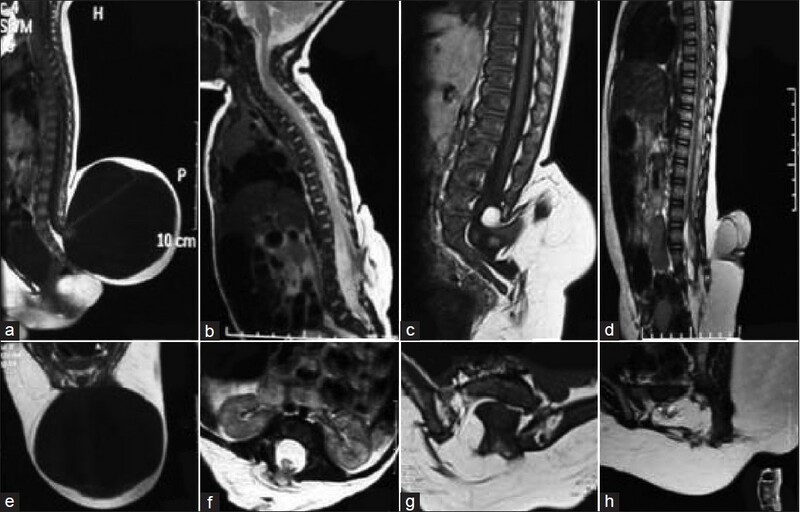 We report a case where a large arachnoid cyst was treated by open fenestration and marsupialization that was complicated by remote intraparenchymal and spinal subdural hemorrhage. The potential physiological changes underlying these complications as well as the related literature are reviewed. Hydrocephalus in its various forms constitutes one of the major problems in pediatric neurosurgical practice. The placement of a ventriculoperitoneal (VP) shunt is the most common form of treatment for hydrocephalus, so that all neurosurgeons struggle with shunt malfunctions and their complications. Well-known complications are connected with the use of the valve systems (malfunction, infectious, overdrainage, secondary craniosynostosis, etc.). 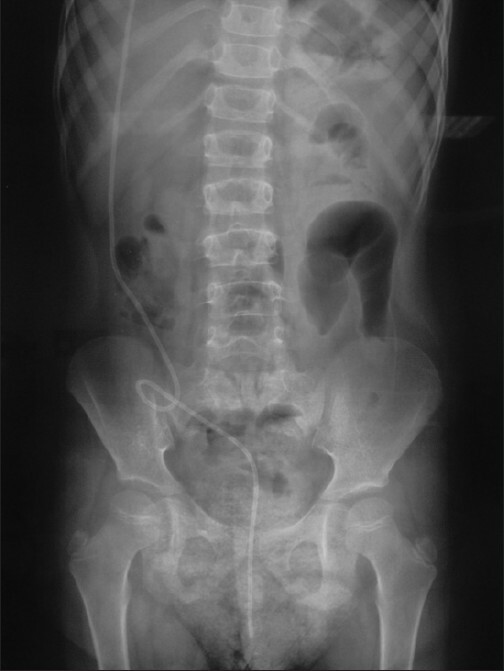 We report an unusual case of protruding abdominal catheter from the urethra. This girl had received a VP shunt for hydrocephalus following surgery of posterior fossa medulloblastoma 4 years ago. After admission, the entire system was removed, antibiotic treatment was administered for 2 weeks, and a new VP shunt was placed. The postoperative course was uneventful. This complication is extremely rare. Migration of the proximal and distal catheters of the ventriculoperitoneal shunt is a very rare event. Here, we report two infants with hydrocephalus and ventriculoperitoneal shunt who presented later with shunt coiling and migration. The first infant was admitted with scalp swelling around proximal incision 3 months after shunt insertion and migration and coiling of both ventricular and peritoneal catheters occurred under the scalp at that point. The second patient was referred 1 month after shunting with tense fontanel and vomiting. New brain imaging confirmed the whole shunt inside both lateral ventricles. The possible mechanisms causing this very uncommon complication and the management are explained. 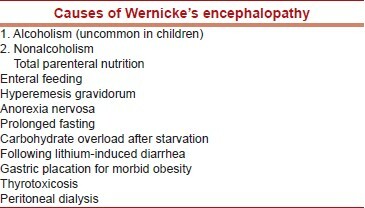 Infantile Alexander disease (AD) is a rare leukodystrophy characterized by its early onset within 2 years of life and clinically presents with macrocephaly, seizures, and retarded psychomotor development. 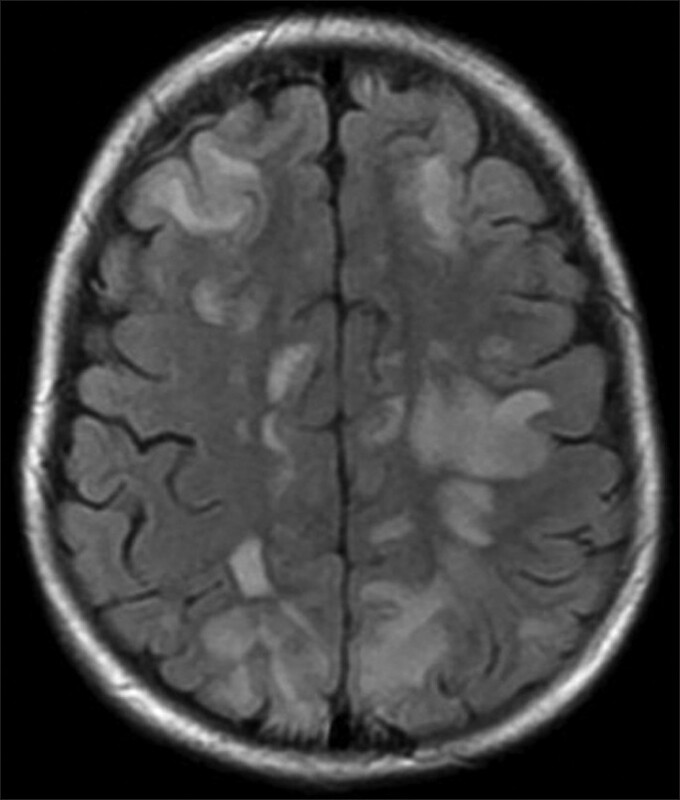 Magnetic resonance imaging (MRI) shows characteristic symmetric white matter abnormalities with frontal predominance. 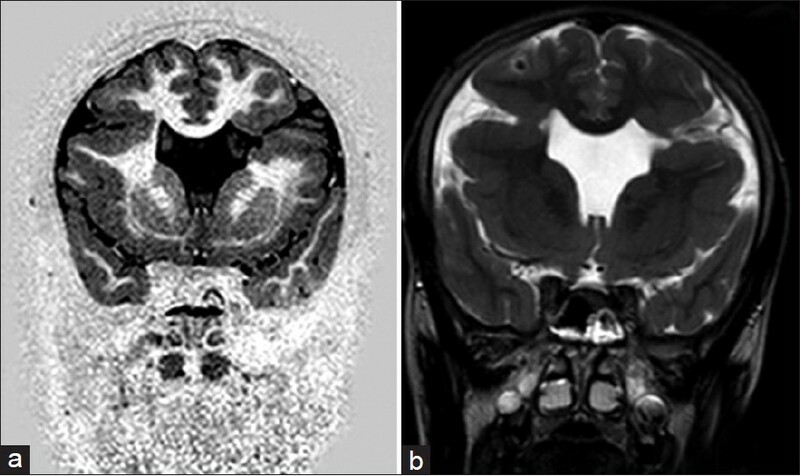 We present a case of infantile AD with typical clinical characteristics and MRI features. 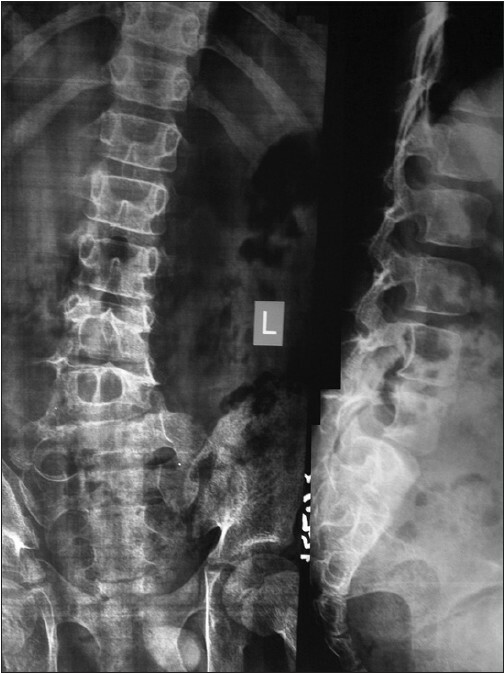 We report a 14-year-old boy who presented with loss of consciousness and gait instability. The electroencephalogram (EEG) showed generalized slowing with irregular activity and cerebral magnetic imaging revealed asymmetrical nonspecific signals on basal ganglia. His second electroencephalogram revealed periodical generalized high-voltage slow wave complexes which did not disappear with diazepam induction. Subacute sclerosing panencephalitis (SSPE) was considered and the diagnosis was confirmed with the identification of measles antibodies in cerebrospinal fluid. 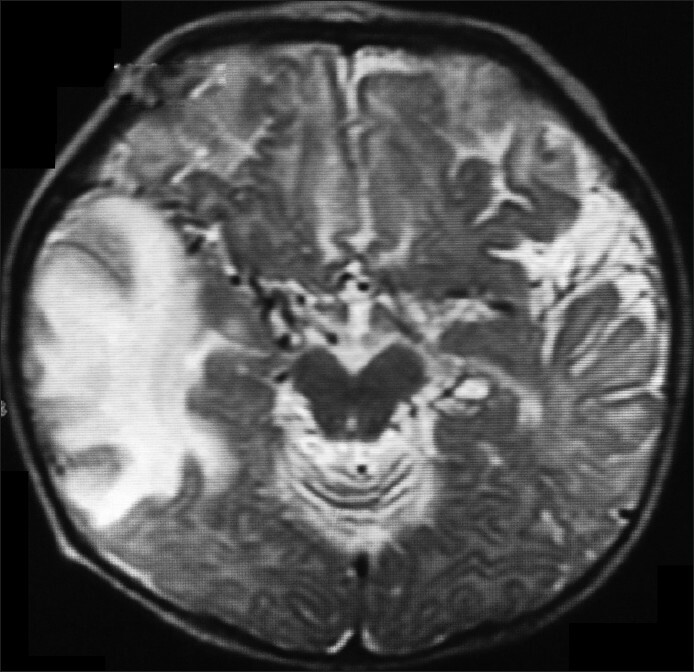 Our findings show that SSPE should be in mind in the differential diagnosis of meningoencephalitis and acute disseminated encephalomyelitis and highlight the significance of EEG in the diagnosis of unidentified cases. Small spinal intradural extramedullary schwannoma are a common occurrence in the middle aged. However, giant schwannoma in pediatric age group is rare. 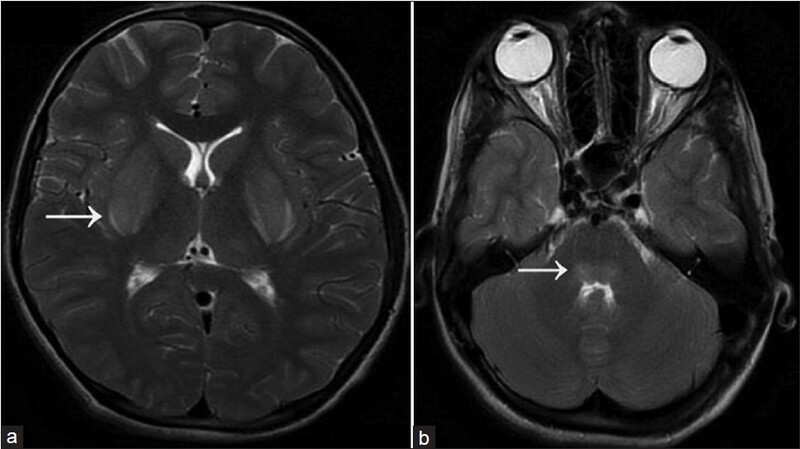 We report one such case of giant extradural lumbosacral schwannoma in an 8-year-old child. 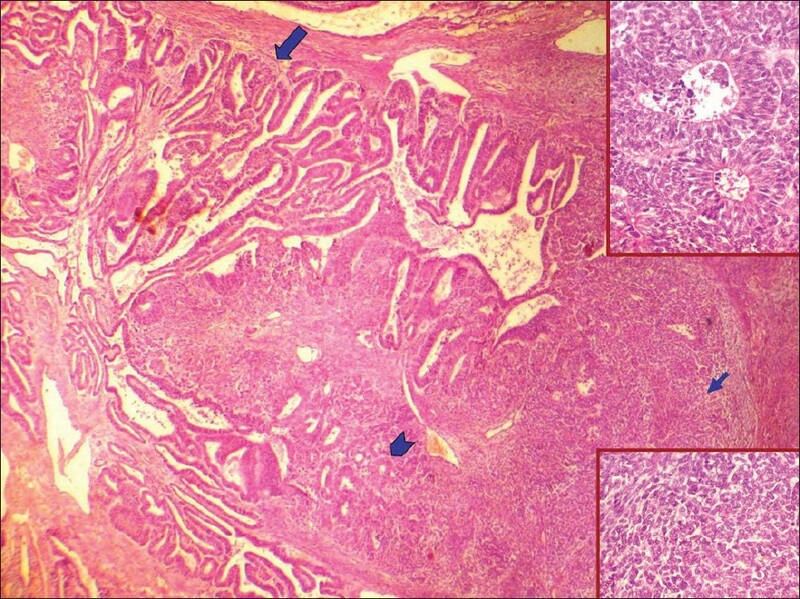 Clinical features, histopathology and management of giant schwannoma is discussed and the present literature reviewed. Management of painful lumbar disc degeneration is one of the most common conditions treated by spine surgeons. Several recent prospective multicenter trials have demonstrated the effectiveness of artificial lumbar disc replacement in treating discogenic lower back pain. Though data on the safety and effectiveness has gradually been accumulated in adults, there is a lack of published data on the effectiveness and feasibility of lumbar artificial disc replacement in adolescents. The authors share their initial clinical experience with lumbar disc replacement in a couple of adolescents. We report a case of rabies encephalomyelitis in a 12-year-old boy who had received anti-rabies vaccine 6 weeks after being bitten by a puppy. 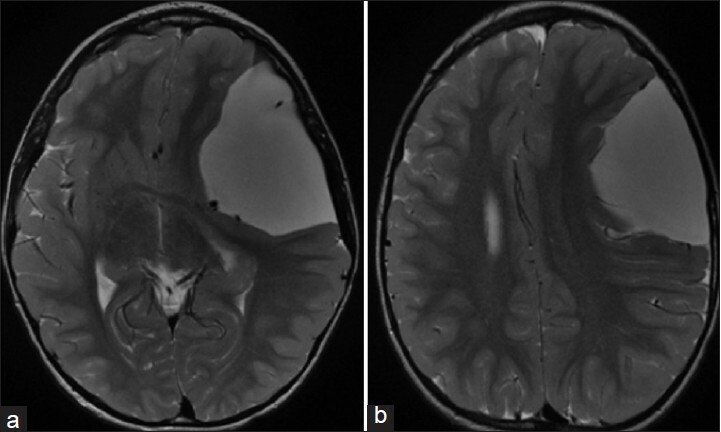 The MR (magnetic resonance) imaging helped to differentiate rabies from acute disseminated encephalomyelitis (ADEM). ADEM involves the white matter predominantly, whereas rabies has a predilection for grey matter, that too of midline regions. 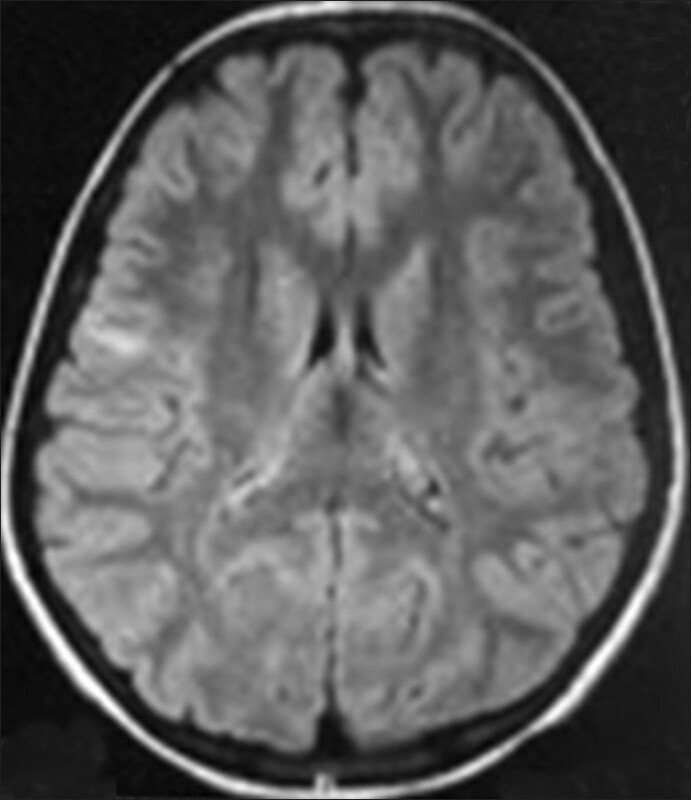 This report emphasizes the usefulness of MRI in differentiating rabies and ADEM when encephalomyelitis occurs in a vaccinated child. The incidence of pediatric aneurysms is rare compared to that of the adults. The natural history and the course of these aneurysms were not well understood. 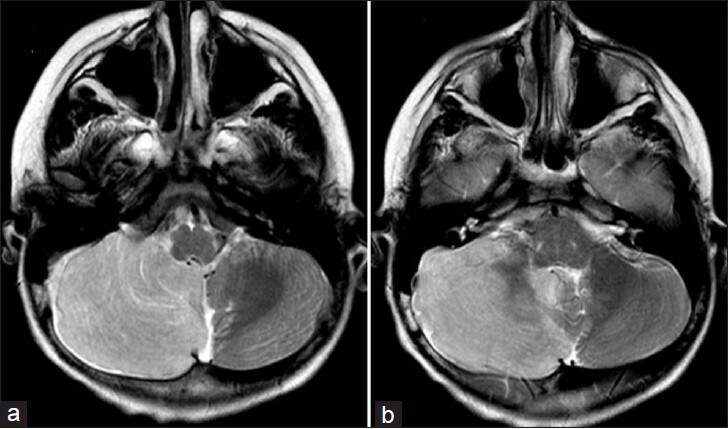 We present a rare case of spontaneously thrombosed basillar tip nongiant aneurysm in a 9-year-old male child who presented with symptoms of mass effect and subsequently followed up by imaging over a period of 1 year.